What’s it all about? TheJournal.ie takes you through the Health Committee proceedings. THE GOVERNMENT HAS already published the heads of the Protection of Life during Pregnancy Bill 2013 but that marked only the first rung in a multi-step process towards legislating for abortion in Ireland. The draft ‘heads of bill’ is not actually the final wording of the proposed new law. They are simply the starting structure for what the final Act will eventually look like. This is where Jerry Buttimer’s Oireachtas Health Committee comes in. The document was sent to the members of the committee and they have convened three days of hearings to gather feedback and opinion from experts in medical, legal and psychiatric fields. Buttimer is expected to report back to the Minister (James Reilly) by the end of this month so he can consider any necessary adjustments before finalising the wording of the Bill. It will then be sent through the various stages of the Dáil and Seanad. First, we have to gear up for three full-day sessions, featuring the masters of Ireland’s maternity hospitals, barristers at law, solicitors, and psychiatrists, as well as regulatory and representative bodies and policy makers. Unlike the committee’s previous hearings, there will be few representatives from advocacy or religious groups giving evidence. However, there will be lawyers and doctors – seen as experts in their fields – who have already made their views (both anti-abortion and pro-choice) public. 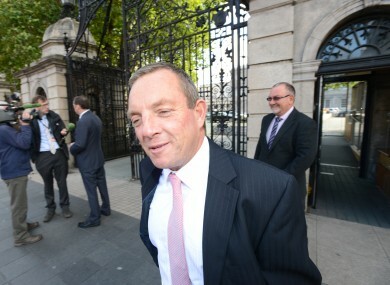 Buttimer, who was widely praised for his role in the intensive hearings ahead of the drafting of the heads of bill, has described the proceedings as “pre-legislative scrutiny”. “As a committee, we hope that the debate is conducted in a temperate and moderate fashion, and that the hearings make a considered contribution to the shaping of this significant legislation,” he said earlier this week. All eyes will be on today’s afternoon session (from 2.30pm) when the masters of the Rotunda Hospital and National Maternity Hospital give evidence. Dr Peter Boylan, who provided key testimony in the inquest into the death of Savita Halappanavar earlier this year, will also take the stand. In previous remarks, Dr Rhona Mahoney has called for clarification of the law as she wants to know that she nor the women she treats will go to jail. During the hearings, each witness will have the opportunity to make an opening presentation and then will be asked questions (taken in bulk) from members of the committee and then other members of the Oireachtas who are in attendance. Proceedings can be watched live on UPC Channel 207 and online at the Oireachtas website. They will also be streamed live on TheJournal.ie, where our reporters will also be live-blogging the details. Email “A crash course in today's abortion legislation hearings”. Feedback on “A crash course in today's abortion legislation hearings”.